Is your closet full of dresses you no longer wear? Now there is a way to clean your closet, help the environment and give back to Chicagoland high school seniors by recycling your special occasion dresses. These dresses will be made available at a dress boutique on April 18 and April 25. The boutique is located at Price School, 4351 S. Drexel Blvd., in Chicago. CHICAGO — A prom dress drive that will gather gently used formalwear for Chicago teens kicked off Saturday at Agassiz Elementary School in Lakeview. Glass Slipper Project and USAgain are partnering for the annual Prom Goes Green event to help Chicago high school students find new or gently used prom dresses for their senior dances. Since 1999, the Glass Slipper Project has been helping seniors and junior around Chicago find their dream dress for the big dance. During dress boutique days on April 18 and April 25 at Price Elementary School, 4351 S. Drexel Blvd, high school senior and junior girls with valid student IDs can search for a dress to take home with them for the prom. “Students have the opportunity to help the environment while finding prom dress that is cost effective,” said Mattias Wallander, CEO of West Chicago-based USAgain. Anyone interested in donating a dress can do so from until April 11th at at any USAgain Bin location. Ald. Timothy Cullerton (38th), 5817 W. Irving Park Road. CHICAGO, IL (Jan. 20, 2015) — More than 54 million pounds of textiles were collected in USAgain recycling bins across the country in 2014. That’s 12,311 garbage trucks diverted from going to landfills! That’s good news if for environmentally conscious consumers looking beyond the trash can for a convenient, no-cost approach to getting rid of an out-of-style shirt or those too-skinny jeans. With Americans throwing 85 percent of their old and unwanted clothing in the trash, amounting to 11 million tons a year, clothing bins play an increasingly important role in keeping unwanted textiles out of landfills. 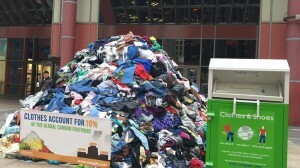 USAgain (pronounced use-again), the West Chicago-based textile recycling company, built a “mountain” of clothing – the equivalent of one full garbage truck or 10,000 pounds of clothing -to demonstrate the impact of clothing that gets discarded in the trash and the need to conserve landfill space. The clothing display was located on the plaza of the James R. Thompson Center, 150 W. Randolph St, in Chicago. According to the US Environmental Protection Agency, Americans throw away 85 percent of all of their unwanted clothing and shoes into the trash. While the recycling household items, like paper, bottles and cans, has become second nature to many Americans, many still don’t realize that clothing can be recycled too. USAgain’s mission is to reduce the negative impacts of clothes and shoes on our environment by increasing their reuse and recycling. USAgain gives a new life to discarded clothing by putting them back in the use stream as second hand clothing. Clothes that are not in condition to be re-worn are shredded to make new material like insulation for homes and car industry or to reclaim fiber to make new fabric. 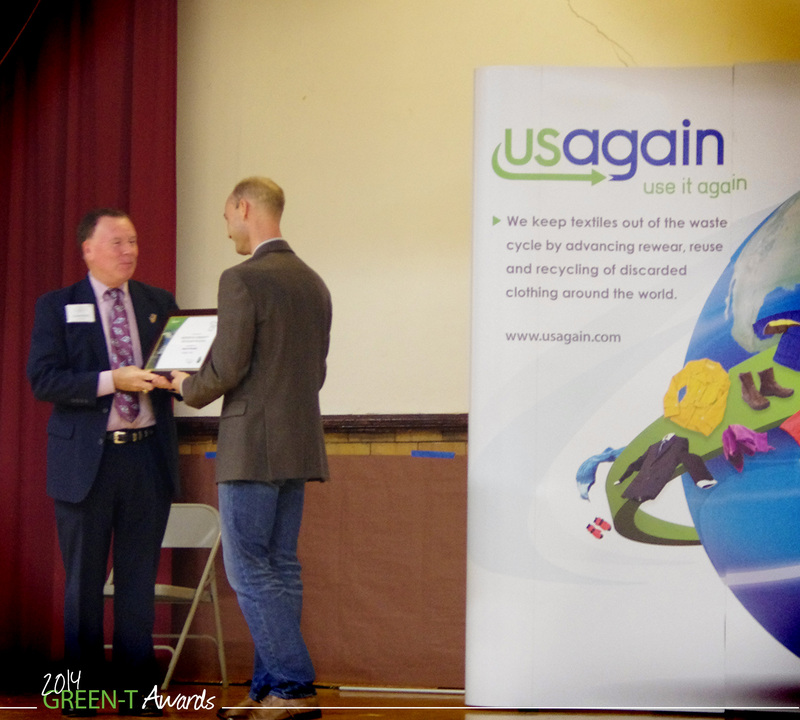 USAgain, the textile recycling company based in West Chicago, IL, has announced the winners of its annual Green-T Awards. Hanover Township, recipient of the award for Innovative Community Recycling Program, was one of the 15 award winners. The Green-T awards are to recognize and reward individuals or organizations that support recycling and sustainability in Illinois. The awards were presented Oct. 7 at the Green-T Awards ceremony where P. Craig Ochoa, Township Highway Commissioner, accepted the award on behalf of the township. The township has welcomed clothes and shoes recycling into the community by adding these items in their annual Recycling Extravaganza and collected 1,815 pounds of textiles for recycling. The Recycling Extravaganza celebrates its fifth year of success as comprehensive recycling drive for the community. The township also offers multiple recycling centers. By recycling 1,815 pounds of textiles, the team saved more than 12,600 pounds of CO¬2 from entering the atmosphere; they also saved more than 2.4 million gallons of water through their commitment to recycling. The Hanover Township serves as a role model for communities in Illinois and across the country. Other recipients of USAgain’s Green-T Awards include Agassiz Elementary, Hanover Township, Chicago Sky and Environmental Defenders of McHenry County. For a full list of award recipients, visithttp://www.usagaingreentawards.com/winners. 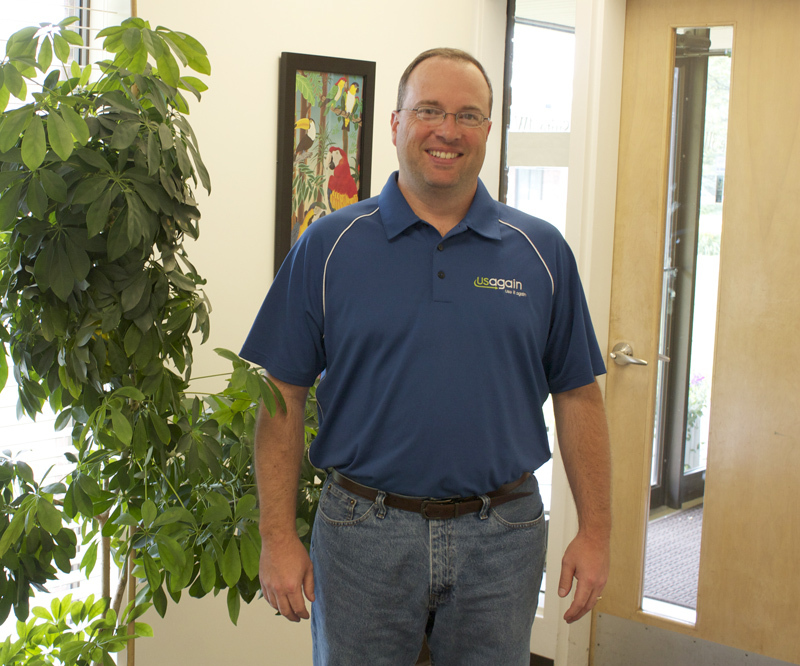 Doug is Chicago’s Division Manager, responsible for managing operations in Chicagoland, Northern Indiana, Southwest Michigan and Eastern Iowa. Doug studied Sports Management at the University of Wisconsin-LaCrosse in addition to earning his MBA from Keller Graduate School of Management. He likes to spend free time playing golf, poker and coaching softball, and appreciates working at a company concerned with protecting the planet for his children to enjoy. Textile Recycling: What Happens to the Non-Reusable Stuff? When recycled clothing gets a second life that can mean a lot of things. Most clothing collected by USAgain and other textile recyclers is reused in its original form as secondhand clothing, but what about the stuff that’s too worn our to be re-worn? 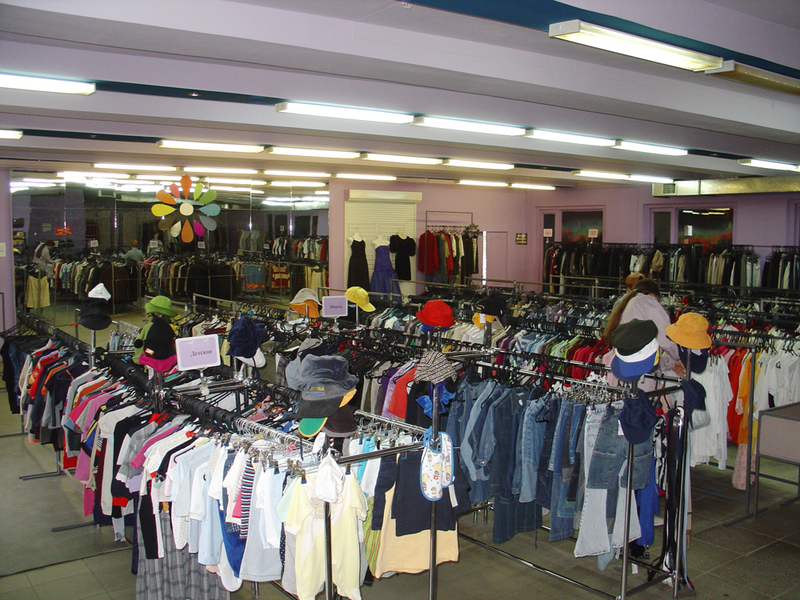 Clothing resale outlets typically don’t sell clothing that’s deemed to be defective, but to recycling companies, such items are still perfectly OK. When you recycle the stained, old t-shirt you used to wear for gardening or working on the car, there’s a good chance it’ll be turned into a cleaning rag, mop or similar product. 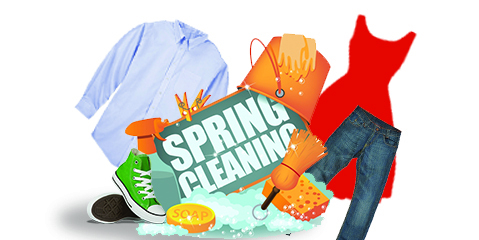 Ironically enough, clothing too dirty to be re-worn is ideally suited to be turned into cleaning materials. Companies like Coastal Wipers sell a considerable selection of wiping cloths and shop towels made from various recycled clothing items. Buying recycled towels is a smart alternative to buying new ones, and industries (notably the oil industry, ironically) have been using recycled shop towels for quite a while. There’s really no need to use precious cotton, water and other resources to produce cloths that could be made from recycled items. In fact, about 17 gallons of water is used to produce a new shop towel—17 more than to create a recycled one. Jinja, a Portuguese company that sells products made from recycled textiles, offers some of the most aesthetically appealing items made from recycled textiles. A few of their recycled items include this Jackson Pollock-inspired placemat and wine bottle coolers prove that textiles can be recycled into more than cloths and rags—they can be made into interior design pieces with a bit of flair. According to EPA data, all textiles are recyclable but only 15% actually are. These mistakenly trashed items often include the ripped, stained and damage items that are no longer suitable for regular ware. While it may be fair to say a ripped article of clothing is no longer fit for reuse, it’s patently false to say it’s useless—it’s a perfect fit to be recycled into something new. We’d be remiss if we failed to mention the economic gains made possible by the recycling of textiles. Recycling clothing also creates ten times more jobs than waste removal and landfilling. Recycling textiles creates jobs, conserves resources and keeps harmful waste from entering landfills. Next time you find yourself with an unwearable t-shirt, we trust you’ll know what to do with it. A staggering 300 million pairs of shoes are thrown away and sent to landfills each year, and despite this massive amount of waste, it can all be avoided. Every pair of old shoes, no matter how worn-out or beat-up, can be reused or recycled and avoid being landfilled. 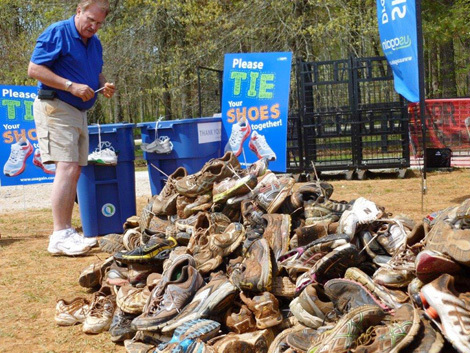 Read more about shoe recycling on our blog.